Home Uncategorized The key to a great spring salad? 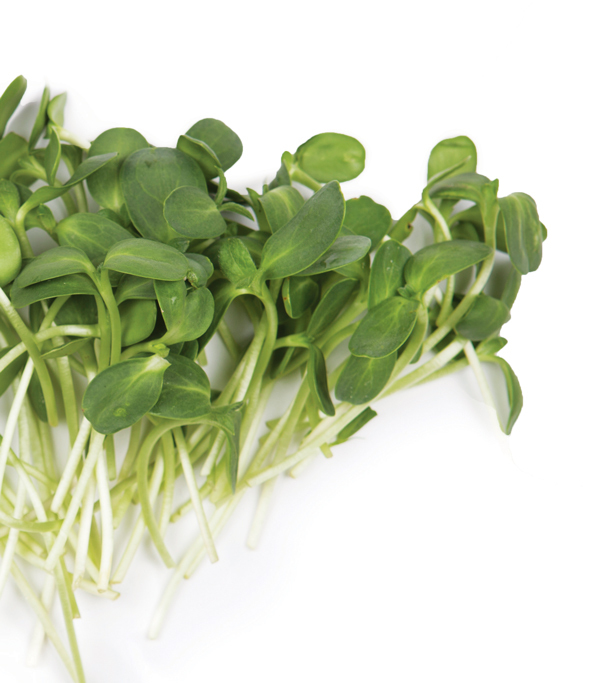 Add these local, flavorful sprouts. Salads are usually the last item to get excited about on a dinner menu. That’s not the case at Atlas, where a smear of housemade buttermilk ricotta comes piled with three kinds of sprouts: nutty sunflower, peppery purple radish, and verdant pea shoots. The unadorned greens taste incredibly of butter, turning a deceptively simple salad into a work of art. For Vonnie Webb, the urban farmer who supplies them, it’s hard to imagine a brighter spotlight for his crops. Inside a 3,000-square-foot greenhouse near Your DeKalb Farmers Market, Webb, who started Vonnie’s Greens back in 1983, harvests about 1,000 pounds of wheat grass, buckwheat lettuce, and sprouts a week. He provides greens to more than 50 area juice bars and nearly 30 restaurants, including Ria’s Bluebird and Bantam + Biddy. Devoted to using homemade compost for maximum nutrition and taste, Webb is unwilling to alter his methods to undercut his competitors. “Either you get it or you don’t,” he says. Find them intown at Sevananda and Rainbow Grocery.